A recently found jawbone dating from 2.75-2.8 Mya, pushes back the date of the oldest fossil of genus Homo.1“Oldest human fossil found, redrawing family tree:, http://news.nationalgeographic.com/news/2015/03/150304-homo-habilis-evolution-fossil-jaw-ethiopia-olduvai-gorge/. Homo rudolfensis lived in East Africa around 1.9-1.8 Mya. His brain was larger and his face longer than those of H. habilis, but his chewing teeth were larger, more like those of Paranthropus. Some paleontologists think he was an Australopithecus; some others, the same species as H. habilis. No good example of his skeletal structure has been discovered. A recent find of a cranium and jawbones.2New fossils confirm diverse species at the root of our lineage”. Smithsonian Human Origins Program,http://humanorigins.si.edu/research/whats-hot/australopithecus-sediba-%E2%80%93-new-analyses-and-surprises. http://humanorigins.si.edu/research/whats-hot/new-fossils-confirm-diverse-species-root-our-lineage supports the idea of H. rudolfensis as a Homo. Homo ergaster (considered by many paleontologists to be early African H. erectus) lived 1.9-1.5 Mya in East Africa. He was the first hominin to have a body silhouette similar to that of modern humans and his proportions indicate that he lived on the ground. He was 1.7 m tall and capable of running and of walking long distances. His brain, at 850 cm3, was bigger than that of Paranthropus, but not yet that of a modern human, one more piece of evidence that larger brain size followed bipedalism on the evolutionary time scale, rather than preceding it. It is easy to imagine H. ergaster as the first “naked ape”. H. ergaster used primitive tools of the “Olduwan” culture.3Tools will be discussed in more detail in a later paragraph. 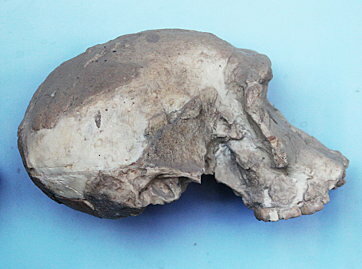 A skull discovered in 2001 from Dmanisi, Georgia, dated at 1.8-1.7 Mya possesses certain features of Homos habilis, erectus and rudolfensis, suggesting that they may not be distinct species.4“Complete skull from Dmanisi”. Smithsonian Human Origins Program, http://humanorigins.si.edu/research/whats-hot/complete-skull-dmanisi. This also is the oldest good fossil evidence for hominins outside Africa. 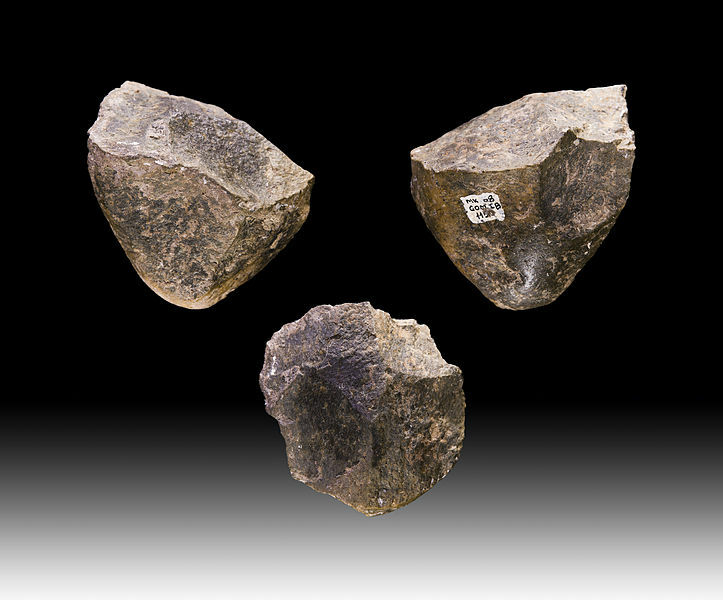 Oldowan tools were found on the site. As usual in paleontology, there is dispute about which was the first modern human fossil to be found. Deserving or not, Cro-magnon man generally wins the prize, having been found in a cro (shelter) on the farm of Mr Magnon in south-central France in 1868.5Modern Homo bones known as the “Red Lady”, because they were smeared with ochre, had been discovered in Wales in 1822-23. These early H. sapiens were more robust than modern humans, but otherwise resembled them closely. Actually, some of them had bigger brains than we do. 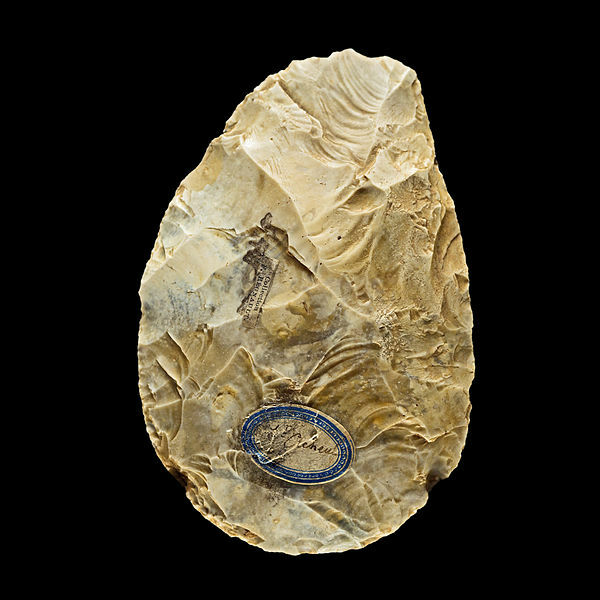 The Paleolithic, or Old Stone Age, is taken as extending from the first known appearance of stone tools about 3.3 Mya in Kenya6Before 2014, the oldest was 2.6 Mya in Ethiopia. and extending to the end of the last Ice Age about 10 Kya. It is divided into three periods. After dinosaurs disappeared from the surface of the Earth about 65 Mya, the number and size of mammal species took off, eventually ranging in size from tiny mouse-like creatures up to elephants and whales. During a particularly warm period of the mid-Eocene, primates came into existence, at first small squirrel-like creatures. About 23 Mya, the primate line split into Old-World Monkeys (catarrhines) and hominoids and the latter split into hylobatids (gibbons and the like) and hominids. From hominids sprang pongines (orangutans) and hominines and the latter begat panins (chimps and bonobos) and hominins. The first hominins were the precursors of man, but not all of them were his ancestors. No direct line from the LCA7Last Common Ancestor of chimps and hominins can be distinguished; the tree of life is rather a bush, with the branches hidden and many twigs representing dead ends. 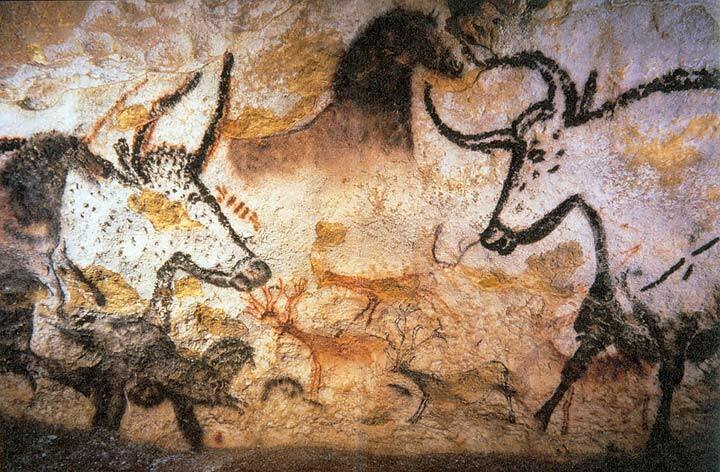 However, there is clear evidence for over twenty species intermediate between the time of the LCA and modern Homo. 1. ↑ “Oldest human fossil found, redrawing family tree:, http://news.nationalgeographic.com/news/2015/03/150304-homo-habilis-evolution-fossil-jaw-ethiopia-olduvai-gorge/. 3. ↑ Tools will be discussed in more detail in a later paragraph. 4. ↑ “Complete skull from Dmanisi”. Smithsonian Human Origins Program, http://humanorigins.si.edu/research/whats-hot/complete-skull-dmanisi. 5. ↑ Modern Homo bones known as the “Red Lady”, because they were smeared with ochre, had been discovered in Wales in 1822-23. 6. ↑ Before 2014, the oldest was 2.6 Mya in Ethiopia.